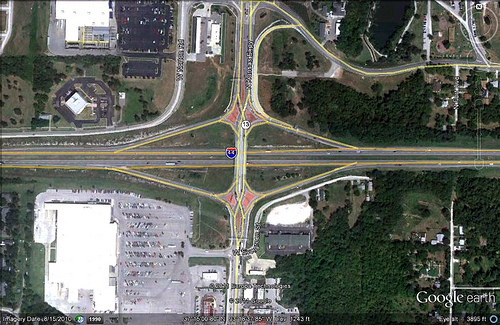 You are looking at something called a "diverging diamond" interchange. Don't ask me to explain how it works or why it's called that by civil engineers. This particular one, west of Springfield, Missouri, marks the intersection of two major freeways. And it's gaining some Internet notoriety for its design, which includes either an earnest attempt to create some walkability in a place that is ridiculously unwalkable no matter what you do to it, or a pro forma attempt to comply with new engineering standards regardless of context, depending on how you look at it. My pal Chuck Marohn of Strong Towns has started a bit of firestorm by going after the diverging diamond both in concept and in this particular instance. Chuck believes that we need more attention to walkable streets and fewer dollars going into insanely expensive, over-engineered highways. He has some fun with this one, doing an entertaining edit of an video someone sent him to illustrate (with approval) the state's attempt to engineer the intersection to accommodate pedestrians and cyclists. There is little that Chuck enjoys more than going after his fellow engineers, and he contrasts the unwalkability of the diverging diamond with the true walkability of places like Amsterdam that really do put pedestrians and cyclists first. If you watch the original video that my comments were based off of, the gentlemen giving the tour was touting how pedestrian- and cycling- friendly this interchange was. That is absurd. This interchange is not "friendly" to pedestrians or cyclists. Suggestions that red decorative brick or yellow markings on the sidewalks would make it so are absurd. If we in the engineering profession can't step back and acknowledge the absurdity of this situation -- the absurdity that mindless adherence to standards has created -- how can we expect to be taken seriously as leaders by a country going through a difficult and painful economic transition? It is not good enough to simply follow the ASCE and demand ever more money for our profession when we turn around and waste it in spectacular amounts on things that provide no return (in this instance, moving cars a little faster and building expensive pedestrian/bike facilities that will never be widely used because they are despotic and demeaning). If we want to be part of the solution, we need to reorient ourselves away from our obsession with moving cars more efficiently and towards building places of value.